The quaint English university city of Cambridge has been home to some of the most influential minds in history – the likes of Sir Isaac Newton, Charles Darwin, and 15 British Prime Ministers once strolled through the city’s well-worn cobblestone streets, which boasts 13 world-class colleges. It is perhaps unsurprising, then, that Cambridge is one of the most visited places in England, with tourists from across the globe flocking to take in the city’s rich history and grand architecture. Finding solace and a place of quietude in which to rest when exploring this bustling city may therefore seem like an impossible feat – at least it would be if it weren’t for the charmingly peaceful Hotel Felix Cambridge. 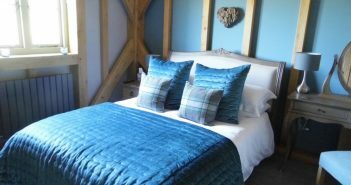 A mile drive down leafy Huntindon Road, which accessibly links the hotel to the centre of Cambridge, the Hotel Fel feels like a private country retreat. 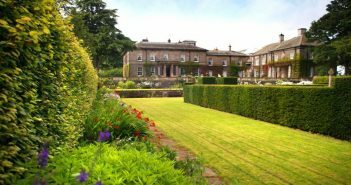 Set amongst manicured gardens, this splendid traditional Victorian building was once a stately family home. And having preserved that feeling of a welcoming personal hideaway, it’s the perfect spot for exploring Cambridge and the surrounding area. 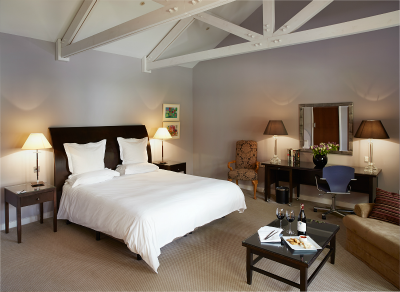 Dating back to 1852, Hotel Felix takes its name from Saint Felix of Burgundy. The imposing statue of a dog at the hotel’s entrance even has its own place in history, and is thought to be a reproduction of a Molossian god with ties to the town of Epirus in north western Greece. Keeping its original wonky beams, enormous fireplaces and light-drenching bay windows, they have also added splashes of vibrant pinks, reds, and purples to freshen up the décor. Contemporary artwork, many of which are available to purchase, adorn the walls and add an element of modern sophistication. 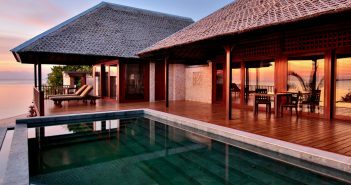 Each of the hotels 52 spacious and elegant rooms have been designed with comfort and luxury in mind. Sprawling king-size beds ensure a restful nights’ sleep after a long day of sightseeing, and the small touches, such as the underfloor heating and rain showers in the bathroom, are welcomed additions. The décor is classic and classy, keeping the colour scheme minimalistic with hues of eggshell grey and deep greens. The penthouse suite is the cream of the crop, tucked away in the eaves of the hotel with a bathtub-mounted TV and an oversized marble bathroom. 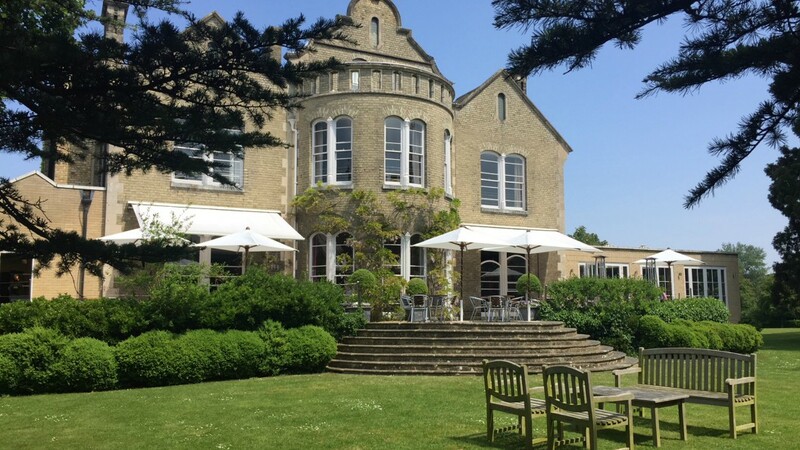 The warmer months are the ideal time to visit the Hotel Felix Cambridge as the rear of the mansion opens up to a beautiful decked area and a lush garden. 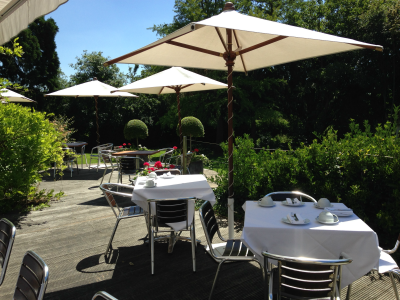 All meals can be served on the patio, as well as aperitifs or the popular house cocktail – Prosecco with elderflower and strawberry, absolutely delicious and the perfect beverage for those pleasant warm English evenings. Breakfast (go for the full English) or, if you prefer, afternoon tea, are ideal times to soak up the blissful rays and enjoy the tranquillity of life in the countryside. 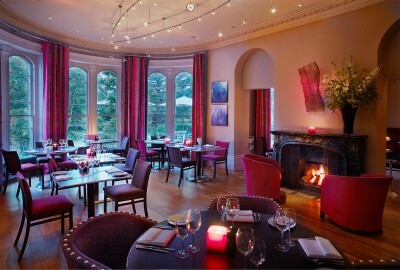 The brightly decorated and sunlit Orangery is the setting for casual dining or pre-dinner drinks. The award-wining Graffiti Restaurant is where friendly staff serve up decadently delicious meals in a stylish contemporary setting. This fine-dining restaurant has a particular focus on seasonal, locally-sourced dishes… with a European twist. Starters include Chapel and Swan smoked chicken rillette, and a pressed heritage tomato terrine served with creamy parcels of burrata and a gazpacho sorbet. The summer vegetable risotto is cut with the summer-garden freshness of mint and pumpkin-seed pesto. For the mains, a hearty roast leg of lamb is paired with crisp spring greens and feta boulangère potatoes; the fresh fish of the day is always a safe choice; and the pancetta wrapped tenderloin of pork with roasted hispi cabbage, taramasalata, and summer vegetables is an absolute delight to devour. Afterwards, the decadent dessert menu is irresistibly tempting. The passionfruit tart with dark chocolate sorbet and mascarpone is heavenly on a summers evening while the chocolate and hazelnut torte served with yoghurt sorbet is a rich, creamy, mouth-watering dish. Finally, the extensive selection of cheeses is the perfect alternative for those who do not have a super sweet tooth.